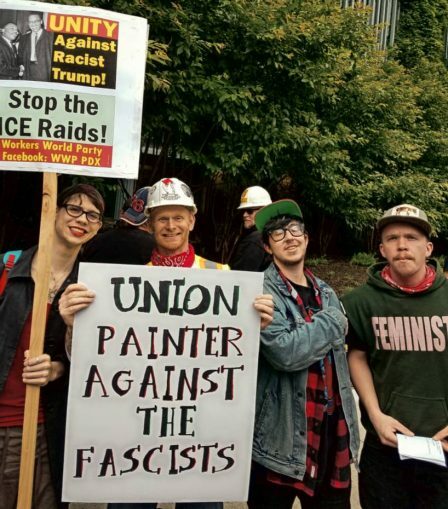 Home » Coast to coast » Fascists overwhelmed in Portland, Ore.
Fascists overwhelmed in Portland, Ore.
Portland, Ore., June 4 — Over 1,500 anti-fascist protesters surrounded a racist, white supremacist rally in downtown Portland today, only a week and change after the MAX train murders took place. The whole city is still in an uproar over the ugly incident on May 26 where a known white supremacist screamed racial slurs at young Muslim women and then killed the two men and seriously injured another with a knife when they defended the Muslim women. Taliesin Myrddin Namkai-Meche, 23, and Ricky John Best, 53, were killed by the racist. Micah David-Cole Fletcher suffered serious knife wounds but is recovering. Out-of-state fascists rallying downtown today with a federal permit only added insult to injury. After breaking up some fascist infighting, the city, state and U.S. Department of Homeland Security police lined up in riot gear facing the anti-fascists. Police distributed their forces along the massive assemblage on the north side of the square, as the anti-fascists on the west side of the square swelled and took the street. The masses kept the pressure on and made the message loud and clear both in word and deed: Fascists are not welcome here.